Artificial Intelligence/Machine Learning field is getting a lot of attention right now, and knowing where to start can be a little difficult. 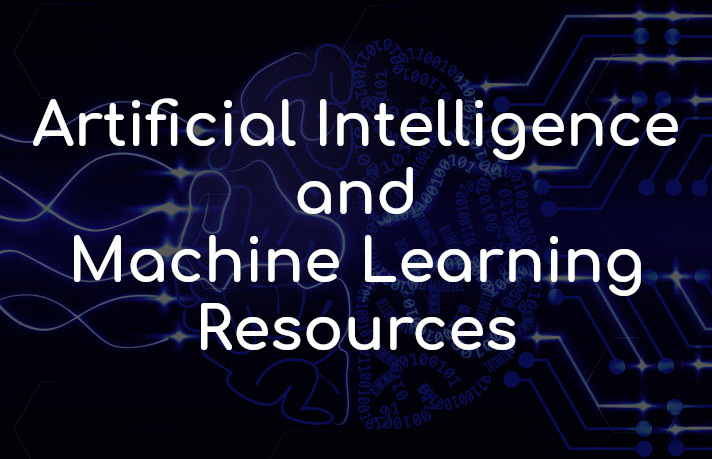 So, today, we will enlist the best resources in one place and hope this curated list help you get started on what you need to know about AI/ML on a technical level. Before that, let's clear the concept of AI and ML. So, what is Machine Learning and Artificial Intelligence? A popular definition originates from Arthur Samuel who was an American pioneer in the field of computer gaming and artificial intelligence and coined the term "machine learning" in 1959. Machine learning is a subfield of computer science that gives computers the ability to learn without being explicitly programmed. In practice, this means developing computer programs that can make predictions based on data. Just as humans can learn from experience, so can computers, where data equal to experience. Artificial Intelligence is the intelligence demonstrated by machines and is different from natural intelligence shown by humans. AI programming opens up a world of opportunities for programmers, and one can create numerous applications across diverse domains. Languages such as Python, R, Lisp, Java, and Prolog are a few of the many languages that can be used for AI programming and to create innovative projects. Due to immense opportunities and a relatively untouched domain, tons of programmers are trying to learn Artificial Intelligence. Why should you learn AI/ML programming? To be master in AI/ML field you need to go through few courses that are available in the market. The ideal course introduces the entire process and provides interactive examples, assignments, and/or quizzes where students can perform each task themselves. It must have a significant amount of machine learning content. Courses must be on-demand or offered every few months. It must be an interactive online course, so no books or read-only tutorials. Courses that are strictly videos with no quizzes, assignments, etc. are also excluded. The courses have to mention outline the steps required for executing a successful ML project and explanation of the machine learning workflow. It must cover the machine learning techniques such as regression, classification, clustering, etc. and algorithms such as naive Bayes, decision trees, support vector machines, etc. Courses that cover more without skimping on detail. Courses must teach the use of popular programming languages like Python, R, and/or Scala and popular libraries within those languages. We believe that we covered every notable course that fits the above criteria. Since there are seemingly hundreds of courses available out there in the market, so, we chose to consider the most-reviewed and highest-rated ones only. Several courses listed below are understandable given that machine learning is an advanced discipline. Learn with Google AI newly launched resource is part of Google’s plan to broaden the understanding of AI among the general public. The material is slowly being added but it already contains a Machine Learning with TensorFlow (Google’s machine learning library) crash course. The course covers the ground from a basic introduction to machine learning to getting started with TensorFlow, to designing and training neural nets. It is designed so that those with no prior knowledge of machine learning can jump in right at the start, those with some experience can pick or choose modules which interest them, while machine learning experts can use it as an introduction to TensorFlow. Google’s TensorFlow might be the option which does a lot of the heavy lifting for you and really want to make true artificial intelligence systems from relative scratch. While it’s something that will take longer to put together, you’ll learn a lot more about deep learning and artificial intelligence. TensorFlow is “an open source software library for numerical computation using data flow graphs”. It would be best for things like training your own image recognition system or learning to do language processing. You could also make conversational AI with TensorFlow that is trained on specific data. Machine Learning Engineer Nanodegree (Udacity) - Udacity’s flagship Machine Learning program, which features a best-in-class project review system and career support. The program is a compilation of several individual Udacity courses, which are free. Co-created by Kaggle. Estimated timeline of six months. Currently costs $199 USD per month with a 50% tuition refund available for those who graduate within 12 months. It has a 4.5-star weighted average rating over 2 reviews. Machine Learning (Georgia Tech/Udacity) - A compilation of what was three separate courses: Supervised, Unsupervised and Reinforcement Learning. Part of Udacity’s Machine Learning Engineer Nanodegree and Georgia Tech’s Online Master’s Degree (OMS). Bite-sized videos, as is Udacity’s style. Friendly professors. Estimated timeline of four months. Free. It has a 4.56-star weighted average rating over 9 reviews. Columbia University’s Machine Learning is a relatively new offering that is part of their Artificial Intelligence MicroMasters on edX. Though it is newer and doesn’t have a large number of reviews, the ones that it does have are exceptionally strong. It has a 4.8-star weighted average rating over 10 reviews. The course also covers all aspects of the machine learning workflow and more algorithms than the above Stanford offering. Columbia’s is a more advanced introduction, with reviewers noting that students should be comfortable with the recommended prerequisites (calculus, linear algebra, statistics, probability, and coding). This course contains the same content presented on Coursera beginning in 2013. Learn about artificial neural networks and how they're being used for machine learning, as applied to speech and object recognition, image segmentation, modeling language and human motion, etc. It'll emphasize both the basic algorithms and the practical tricks needed to get them to work well. Machine Learning A-Z™ on Udemy course has been designed by two professional Data Scientists so that we can share our knowledge and help you learn complex theory, algorithms and coding libraries in a simple way. You will enter step-by-step into the World of Machine Learning. With every tutorial, you will develop new skills and improve your understanding of this challenging yet lucrative sub-field of Data Science. This course is fun and exciting, but at the same time, it dives deep into Machine Learning. It has a 4.5-star weighted average rating over 8,119 reviews, which makes it the most reviewed course of the ones considered. It covers the entire machine learning workflow and an almost ridiculous number of algorithms in a good way through 40.5 hours of on-demand video. Stanford University Machine Learning on Coursera is the clear current winner in terms of ratings, reviews, and syllabus fit. Taught by the famous Andrew Ng, Google Brain founder and former chief scientist at Baidu, this was the class that sparked the founding of Coursera. It has a 4.7-star weighted average rating over 422 reviews. Released in 2011, it covers all aspects of the machine learning workflow. The assignments (there are eight of them) can be completed in MATLAB or Octave, which is an open-source version of MATLAB. In Nvidia - ML hands-on course, you will learn the basics of deep learning by training and deploying neural networks. You will implement common deep learning workflows such as Image Classification and Object Detection, experiment with data, training parameters, network structure, and other strategies to increase performance and capability, deploy your networks to start solving real-world problems. On completion of this course, you will be able to start solving problems with deep learning. In University of Washington course, you will get hands-on experience with machine learning from a series of practical case-studies. You will implement and apply predictive, classification, clustering, and information retrieval machine learning algorithms to real datasets throughout each course in the specialization. They will walk away with applied machine learning and Python programming experience. Learning online course is an introductory course in machine learning (ML) that covers the basic theory, algorithms, and applications. ML is a key technology in Big Data, and in many financial, medical, commercial, and scientific applications. It enables computational systems to adaptively improve their performance with experience accumulated from the observed data. ML has become one of the hottest fields of study today, taken up by undergraduate and graduate students from 15 different majors at Caltech. This course balances theory and practice and covers the mathematical as well as the heuristic aspects. Weka is a collection of machine learning algorithms for data mining tasks. The algorithms can either be applied directly to a dataset or called from your own Java code. Weka contains tools for data pre-processing, classification, regression, clustering, association rules, and visualization. Weka is open source software issued under the GNU General Public License. Several free online courses that teach machine learning and data mining using Weka. There is a range of services and courses out there which can provide artificial intelligence, personal assistants, machine learning and more. You don’t need to be a computer science expert to implement some of the core basics of your own practice. Try out a few of the above and see what you can create. If you feel confident, go straight for TensorFlow and make something seriously mind-blowing. Though, there’s always a chance that we missed something, so, please let us know in the comments section if we left a good course out. Thank you!